Once upon a time, elementary school students sat around, talked, and were generally still during recess. Why because they lacked empowerment to move and resources to encourage movement. Then one day life changed as educators and leaders gained a new perspective on the positive effects of movement in early childhood, and every grade was presented with a set of balls to encourage physical activity. Recess was no longer a period of sitting around for the majority but about movement and play. At another elementary school, students attended physical education class with very few resources. They had a few cones for drills and agility exercises but no basketballs. Again, one day their lives and education changed as a variety of balls and equipment were provided to the school so kids could learn how to play basketball and other sports with actual equipment. The story is more than the presence of equipment and resources to facilitate movement. It is about the transformative empowerment of the community formed when physical therapists partnered with local elementary leaders and teachers. The partnership transcended different communities for the increased focus on developing sustainable and impactful movement in and out of the classroom. 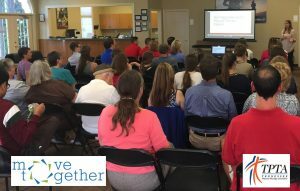 In 2017 in conjunction with PT Day of Service, the Chattanooga District of the Tennessee Physical Therapy Association (TPTA), under the guidance of Zachary Rethron (District Chair), embarked on a journey to positively impact change in their community through movement. They asked where is there opportunity to maximize and empower movement in early childhood within Chattanooga. One area was within two Title 1 low-income, high-need elementary schools: Calvin Donaldson Environmental Science Academy & Orchard Knob Elementary School. Here they engaged in bidirectional communication to share and educate on the importance and impact of physical activity in early childhood both on the playground and in the classroom and to learn about the opportunities to enhance and advance movement within the schools. Zachary reached out to the elementary schools to understand their knowledge of the importance of physical activity for children, especially in the first 10 years of life. He shared the benefits and impacts of physical activity in early childhood not only on academic performance and behavior today, but in future health, activity, and the generational impact. After sharing, he asked the leaders, PE teachers, and teachers where they saw the needs for increased movement throughout the school day and what opportunities existed to make that happen. Then collaboratively engaging to see how the Chattanooga TPTA could come alongside them to better the lives of their students and the entire community. Two initial opportunities discovered were to increase resources and classroom teacher knowledge about movement. The next steps were three-fold: reaching out to the Chattanooga TPTA, continuing bidirectional interactions with the local elementary schools, and empowering leadership and PE teachers to spread the word to their fellow teachers. It began with the Chattanooga TPTA leadership presenting to their members a similar presentation on the benefits and impacts of movement in early childhood and how two local elementary schools lack basic equipment to encourage physical activity during recess, PE, and other free blocks. They decided to raise funds to supply fundamental equipment to Calvin Donaldson Environmental Science Academy and Orchard Knob Elementary School as part of their 2017 PTDOS project. Zachary then hand-delivered the new equipment and visited a few months later to experience and listen firsthand to the positive impacts being made. The relationship does not stop there as the Chattanooga TPTA plans to continue engaging and accompanying these elementary schools as they continue to incorporate movement into their classrooms, recess periods, and other school activities. The open communication and sharing and engaging not only the leaders but the entire communities both at the schools and within the Chattanooga TPTA has not only led to healthier communities but to paths of empowerment. The empowerment and betterment of people’s lives for a better world continues to ripple at minimum in the following ways. Inside the Calvin Donaldson Environmental Science Academy, the PE teacher shared with his fellow teachers the importance and impacts of kids moving not only at recess but in the classroom. Through education, teachers were empowered to increase movement in their classroom and encourage active play at recess. Children are now actively participating in recess and engagement in the classroom has increased. 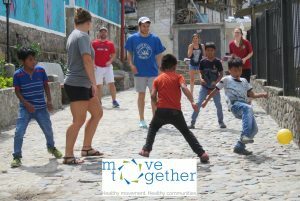 With a single seed planted and cultivated, the lives of students, teachers, leaders, and generations to come are being transformed and empowered to enhance the health of their community through movement. Within the profession, local PT students have increased inspiration and empowerment to ask how and seek a way to be more involved in advancing the profession and movement by seeking opportunities to collaborate and encourage more physical activity. The goal of these partnerships is to develop a sustainable process of educating, empowering, and supporting local schools to maximize the benefits of movement for a healthier community and thus a healthier world. Transformation and empowerment begin with a single seed: cultivated, nourished, and spread by an interdisciplinary group of individuals. Will, you help plant that next seed or cultivate, nourish, and spread the seed already planted? 1. Designed to Move. Designed to move: Active schools report. 2. Designed to Move. Designed to move: A physical activity action agenda. 3. World Health Organization. (2018, February 23). Fact sheet on physical activity. ; Lee, IM, Shiroma, EJ, Lobelo, F., Puska, P., Blair, SN, Katzmarzyk, PT, & Lancet Physical Activity Series Working Group. (2012, July 21). Effect of physical inactivity on major non-communicable diseases worldwide: An analysis of burden of disease and life expectancy.